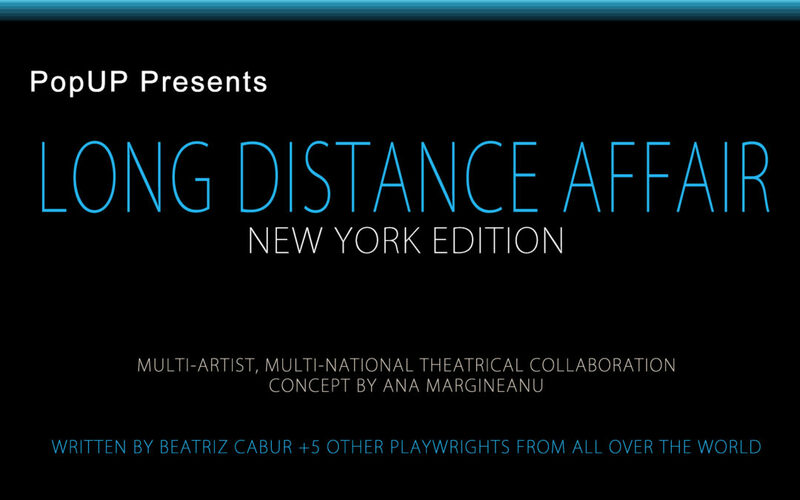 I am thrilled to announce that I will be writing one of the pieces for LONG DISTANCE AFFAIR that will première on February 5th, 2013 at the Gershwin in New York, US. PopUp, the theatrical production company formed by Tamilla Woodard and Ana Margineanu are very happy to start preparing the third edition of LONG DISTANCE AFFAIR and they have invited me for the second time, to be part of this exciting project. In the previous edition, that premièred in México on October 24th, I participated as the director of one of the pieces, ADELA. This time I’ll be writing one of the plays. I’m really excited about exploring the strategies to approach and reach the audience, in this project, from the playwriting point of view. LONG DISTANCE AFFAIR explores the question: “What can you get from one person when all the information you get comes through a computer screen?”. LONG DISTANCE AFFAIR is a one of a kind theatrical event: an on-line show for an audience gathered in one place with performances given by actors spread out around the world. Both me and PopUp share the same interest in the collaborative side of this project and how different theatre makers from different cultures work together. We hope you will find this way of work as exciting as we do. Check out a video of the previous edition of LDA here.